If you want to measure the actual performance of your computer, then a benchmarking utility is a must have. For instance, let’s say that you just upgraded your Kernel (a low level of software utilities that communicate with your PC’s hardware) and it’s said to improve your CPU’s performance while multitasking, then the only way to know if it really has been improved or not is to use some sort of a benchmarking tool. Though a large number of tools available for the MS Windows OS (both free and paid ones), but for the GNU/Linux platform, there aren’t a lot (as far as I know). 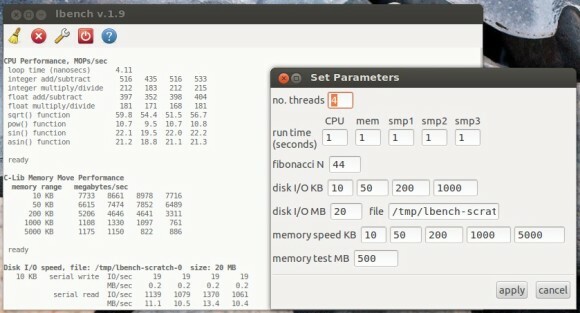 We have the powerful ‘Phoronix test suite’ (it’s GUI is a bit of a pain to setup), a much more simpler tool (still useful) known as ‘systester‘ and then there’s the pretty simple, yet reasonably rich in features (though not as powerful as the ‘Phoronix suite’) and easy to use ‘lbench’ :). It’s a multi-threaded (up to 9 threads) system benchmark tool that runs in the GNU/Linux OS and it benchmarks your CPU (can also be used to ‘stress’ it as well), the RAM (including a memory test) and measures disk drives (IDE/SATA/SSD etc) and their I/O speeds. *. Has few CPU related tests such as a CPU speed and temperature based test called ‘rpm’ (it misread my CPU’s temperature though), thread switching speed (calculates how fast your CPU can switch between multiple processes while multitasking) and thread and process creation overhead tests. *. You can also change the number of threads (1-9), the duration of the tests, change the data size while benchmarking the memory, the disk drives I/O and ‘Fibonacci sequence’ related parameters easily using its ‘edit parameters’ window. *. ‘Kill’ (terminate) a benchmark test anytime you want. *. Run each tests individually or run them all automatically. *. It does not let you save the results to an image. However, you can select its text output and save it into a text file anyway. *. Comes with a command-line and a GUI interface. It has pre-built packages for Ubuntu/Debian (.deb) and Fedora (.rpm) so the installation is pretty easy under those platforms. Update: If you use Debian then you’ll first have to install ‘libgtk-3.0-dev’ package for it to work and it doesn’t seem to be included in the Debian ‘Stable’ repositories (thanks ‘Neil’ for the update). If interested, you can get it from this ‘lbench’ home page and if you’re using Ubuntu (worked without any issues under 12.04 Precise Pangolin) then get the ‘.deb’ file (has both 32-bit and 64-bit versions). Once the download completes, double click on it and the Ubuntu Software Center should take of the rest for ya :). If you use the ‘Unity’ desktop, then search for ‘lbench’ in the Dash. Oh and remember, depending on your HDD’s performance, the Disk I/O test might take some time. That’s it, enjoy!. You should mention libgtk-3.0-dev is needed for this software. Useless for anyone running a stable Debian distro.